This was a strange card game from 1971, which I did not really enjoy playing, it has cards of four colours Red, Green, Yellow and Blue which had a number on it from 1 to 9 and some are action cards too. Each player gets seven cards and the game continues. It is probably a bit complicated to write down the rules, but this game was played in my school every dinner break, as said I tried it but it just bored me totally. I preferred getting a proper set of cards, and not be limited to one game every dinner break, plus snap was not so complicated. It got worse too, as the manufacturers must have known it was boring as they started to have theme sets like Barbie, Batman , Coca Cola and the Muppets too. Even Star Trek was included, and they related it to the Tribbles episode with a Tribble card and a Beam me up Scotty card. 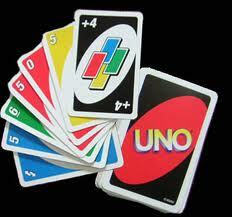 As I said, I never got the point of UNO.